HESS J1702-420 - Mystery Source or Pulsar Wind? The H.E.S.S. survey of the Galactic plane (Aharonian et al. 2006) revealed a significant number of gamma ray sources, some of which are clearly related to particle acceleration in supernova remnants, some more or less line up with known pulsars, but for a handful of sources no counterpart in other wavelength regions is known. 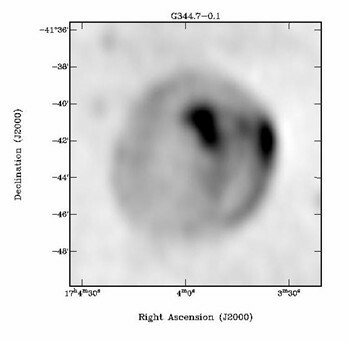 The "dark" sources - with HESS J1702-420 (Fig. 1) among them - seem to contain none or few high-energy electrons, which would create prominent X-ray or radio signals. 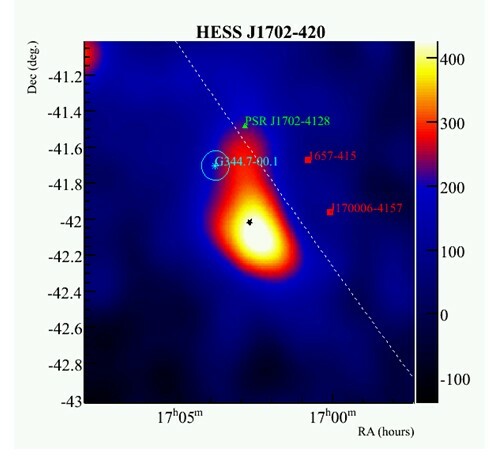 For example, in the ROSAT X-ray data, the only significant X-ray flux detected in the region of HESS J1702-420 (Fig. 2) is most likely related to the well-contained supernova remnantG344.7-0.1, which is also clearly visible at radio wavelengths (Fig. 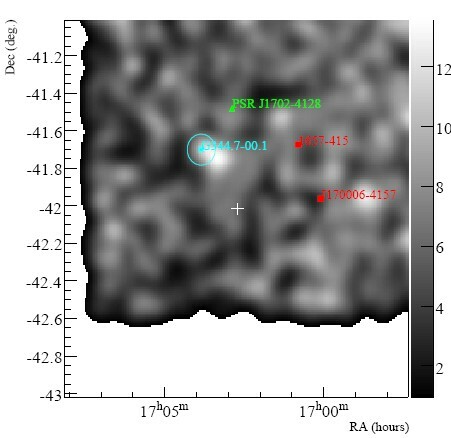 3), but is fairly compact and can hardly be responsible for the extended gamma-ray emission characterizing HESS J1702-420. The nature of "dark" sources has been subject of much speculation; for example, some of them could represent gamma-ray burst remnants (Atoyan et al. 2005) or clumps of annihilating dark matter, although neither of these scenarios fully accounts for their observed characteristics. Recent studies of pulsar wind nebulae - an electron "wind" emerging from a pulsar, see e.g.June 2005 - have opened a possible new interpretation for objects like HESS J1702-420. Quite often, the pulsar wind nebulae are found displaced from the pulsar by fractions of a degree, corresponding to 10 or more parsec. Examples of displaced pulsar wind nebulae include Vela-X, the two nebulae in the Kookaburra region, orHESS J1825-137 (see top figure). Properties of the ambient medium might be responsible for the displacement (see e.g.Sept. 2005), or proper motion of the pulsar, which leaves parts of the nebula behind. Large displacement of gamma-ray pulsar wind nebulae seems to be the rule, rather than the exception. Displacement are also observed for some X-ray nebula (e.g.Gaensler et al. 2003), but are more prominent for gamma-rays, since the gamma-ray emitting electrons usually have a longer lifetime and can travel further. Given these observations in other nebulae, one might now be prepared to accept displacements as large as 1/2 degree, which corresponds to the angular distance from the pulsar PSR J1702-4128 to the center of the HESS source J1702-420. In earlier discussions, an association was considered unlikely because of the large distance. Indeed, this pulsar (seeATNF pulsar catalog) is quite energetic and a few percent of its spin-down energy loss would be sufficient to power the gamma-ray source; comparable or larger efficiency for conversion from spin-down power to gamma-ray luminosity is seen in other pulsars. In this interpretation, it remains open, however, why the gamma-ray emission peaks so far from the pulsar, as opposed to peaking near the pulsar with a long trail away from the pulsar. One might speculate that the pulsar, with a distance of 5 kpc and an age of 50000 years, was much more active in the past and that the gamma-ray profile traces the time evolution of pulsar luminosity. A way to verify any such interpretation of the gamma-ray source as a pulsar wind nebula will be more sensitive X-ray measurements, where ultimately a nebula of nonthermal synchrotron X-rays will have to show up. Fig. 1: Gamma-ray map of the region around the source HESS J1702-420. The preliminary sky map includes additional observations compared to the map published in	Aharonian et al. (2006). The dashed line indicates the Galactic Equator. Green labels show the positions of the pulsar PSR J1702-4128 and of the supernova remnant G344.7-0.1. Fig. 2: ROSAT X-ray sky map of the same region as shown in Fig. 1. The cross indicates the centroid of the gamma-ray source (shown as black star in Fig. 1). An X-ray signal is visible from the vicinity of the supernova remnant, but appears to be unrelated to the gamma-ray source. Fig. 3: MOST radio image of the remnant G344.7-0.1, located at the edge of the H.E.S.S. gamma-ray source. Note change in scale compared to Figs. 1 and 2.